Parveen Sharma is a first class from Delhi University, having done his graduation from Sri Venkateswara College. He qualified Chartered Accountancy Course in 1996 and was placed in merit list (Rank Holder) in Intermediate and Finals both. He is also an Associate member of Institute of Cost and Works Accountants of India and Licentiate of Institute of Company Secretaries of India. He topped Delhi University by scoring 100% marks in Accountancy. He also won Gold Medal in Accounts Olympiad held in 1990. He has the honour of being co-opted as a member to Regional Monitoring Committee (RMC) of Institute of Chartered Accountants of India. 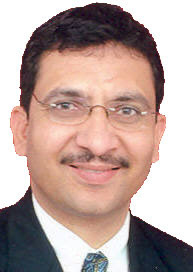 Currently, he has been co-opted as Member, Board of Studies ICAI for the year 2006-2007. He possesses a vast experience of teaching accountancy to students of C.A. Final and C.A. P.E. II (Intermediate), has been visiting faculty at I.C.A.I. and I.C.W.A.I. He is currently teaching accountancy to various levels of Professional Institutes and Universities and has addressed a number of courses and seminars organized by Professional Institutes. He has authored research documents on various issues. * Obtained Highest Marks in Accountancy In B.Com Hons in Delhi University. “Management Accounting – Financial Strategy and Reporting”. PARVEEN SHARMA CLASSES, launched in February 2001, provides specialized coaching for students undergoing the Chartered Accountancy PE. I, PE II and Final. Over the short span of time PARVEEN SHARMA CLASSES have attracted a cumulative enrollment of 14,500 plus students. PARVEEN SHARMA CLASSES has thus emerged as an undisputed Leader of North India for classroom instruction. We conduct result oriented education by taking topic wise tests, queries after classes. To assist students we regularly organize Seminars, guest lectures by renowned personalities, workshops etc. We are first to conduct Lectures through audio visual aids like Cordless Mikes, Overhead Projectors, Visualizers, video clippings through LCD projectors. We organize different type of activities for motivation, relaxation and entertainment. Today, PARVEEN SHARMA CLASSES offers classes in all subjects of the CA PE-I, PE-II and Final level in its own grand building with spacious, fully air-conditioned class rooms with 100% power back up. The faculty of PARVEEN SHARMA CLASSES is one of the best in North India.